I think I may be an idiot. In Doomwar #4 T'Challa, the original Black Panther (not the fist held high kind), faces a very tough decision which involves the protection of his nation, Wakanda. 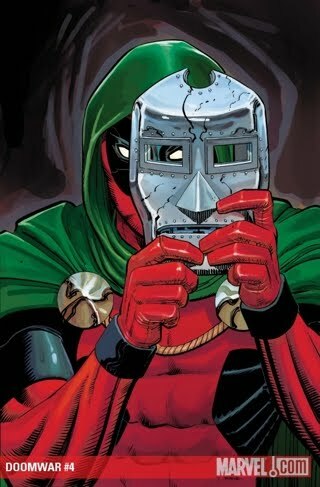 His nation, and nation's forces, are being devastated by Doctor Doom's newly vibranium (material stronger than diamond) enhanced Doombots and T'Challa has to bring in some outside help. But who could he bring into the mix ready to fight...if the money is right? Well, I think the Doomwar #4 cover is supposed to elude to who T'Challa is forced to contact, but while I was reading the comic of the day I had know idea who he was going to ask for help. I was thinking it was going to be some villain he has squared off with before, but I could not think of one mighty enough to take on Doom or one whom wasn't already being used in another Marvel storyline. I think John Romita Jr. did a good job of tricking the audience in a strange way. The cover seemed to be just another "oh god, another one of these covers" cover, but it turned out to actually have some meaning to the book. The assumption of the cover character's appearance on the comic book cover as just another marketing scheme was a poor one, yet one I was glad to make. The surprise at the end was just that to me...a surprise. With everything above said, I still care very little for this mini series. I just don't care because the story doesn't seem as if it will have an impact on characters I care about or even the Marvel universe as a whole. The book is purchased every month now just to finish out the run. It just feels wrong to have a partial mini series. It's like buying three turkeys at the store because when you get three you receive 25% off, yet you only need one. To be honest, I'd rather have three turkeys than this whole series.